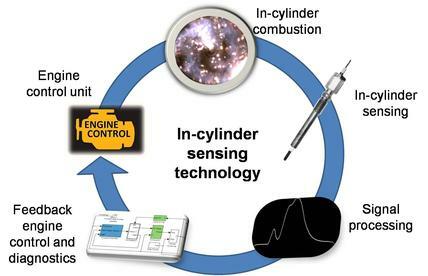 To help improve the efficiency and reduce emission of internal combustion engine, DEP has developed new capability for real time in-cylinder sensing. An advanced in-cylinder combustion sensor complemented with our proprietary advanced algorithms has the potential to replace pressure sensors, oxygen sensors and knock sensors. The latest technology from DEP enables performing multiple sensing tasks and real time Engine management by provided feedback to the electronic control of engine to achieve goals of future stringent emission norms and fuel economy standards. 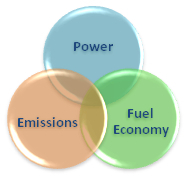 C sensors are superior to pressure transducers as they can predict combustion, performance and engine out emissions in addition to their low cost. The advanced IC sensors with our new IP algorithms have the ability to produce basic information about engine combustion, performance, and emissions parameters on a cylinder-to-cylinder, and a cycle-by-cycle basis. These unique abilities are necessary to control and fine tune the production engine to meet its targets over its life time. With IC sensors the above can be achieved without the need for drilling another hole in the cylinder head by adapting the fuel injector or spark plug or glow plug as the ion sensor. IC inc is the result of a strategic industry institution tie-up by DEP.